The raw materials used to make fiberglass insulation comes from recycled glass and glass made from scratch. The raw materials to make glass (sand, limestone, etc) are mined from the U.S. When the materials are ready for manufacturing, they are transported by truck or rail by U.S. workers. Fiberglass insulation is manufactured and packaged in U.S. manufacturing facilities. After manufacturing and packaging, the finished product is transported by truck or rail by U.S. workers to distribution points. Fiberglass insulation is sold at various points throughout the country at distributors, retail stores and through insulation contractors by U.S. workers. 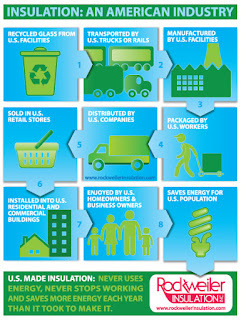 The energy saving benefits of fiberglass insulation helps keep U.S. residents comfortable and helps save U.S. energy. Let’s not forget about one more important point! Unlike other energy efficient tools such as appliances, light bulbs, etc., fiberglass insulation, once installed, never uses energy. It saves energy 24/7 and saves more energy in a year than the energy it took to make it – and continues to do so each and every year it is in the building.